Even the most dangerous animals are rarely as threatening to the survivor as the rest of the environment. Common sense (we hope) tells the survivor to avoid encounters with lions, bears, and other large, obviously dangerous animals. You should also avoid large grazing animals with horns, hooves, and great weight. Your actions may prevent unexpected meetings — meetings you really, reall don’t want to be involved in. Move carefully through their environment. Do not attract large predators by leaving food lying around your camp. Carefully survey the scene before entering water or forests. 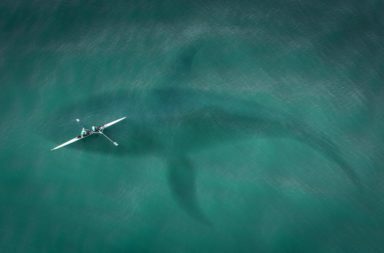 Many smaller animals actually present more of a threat to the survivor than large animals, however. To compensate for their size, nature has given many small animals weapons such as fangs and stingers to defend themselves. Each year, a few people are bitten by sharks, mauled by alligators, and attacked by bears. Most of these incidents were in some way the victim’s fault. 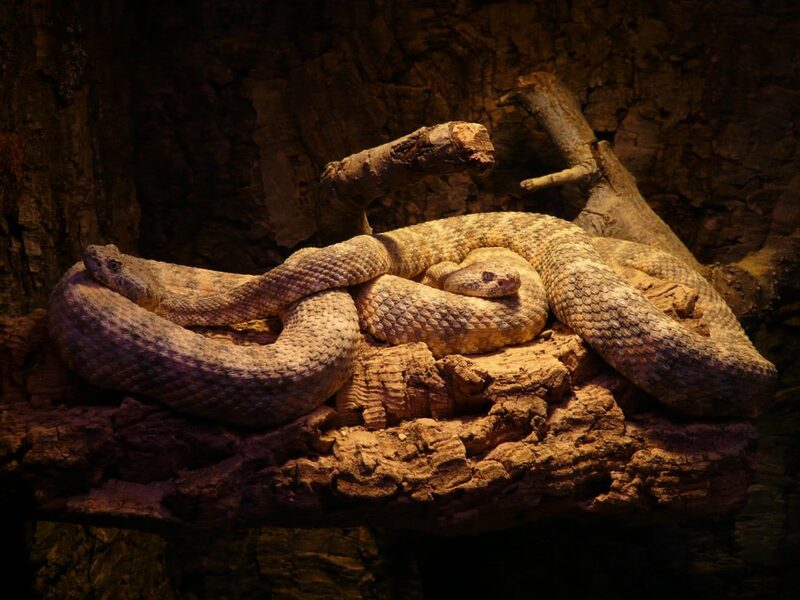 However, each year more victims die from bites by relatively small venomous snakes than by large dangerous animals. Even more victims die from allergic reactions to bee stings. For this reason, we will pay more attention here to smaller and potentially more dangerous animals. These are the animals you are most likely to meet as you unwittingly move into their habitat, or they slip into your environment unnoticed. It’s easy to recognize and identify insects — except centipedes and millipedes — by their six legs while arachnids have eight. These small creatures become pests when they bite, sting, or irritate you. 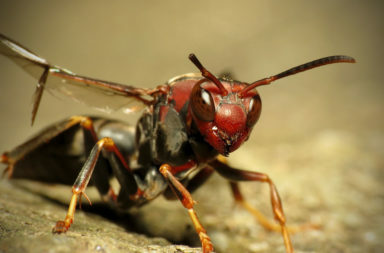 Although their venom can be quite painful, bee, wasp, and hornet stings rarely kill a survivor unless he is allergic to that particular toxin. Even the most dangerous spiders rarely kill, and the effects of tick-borne diseases are very slow-acting. 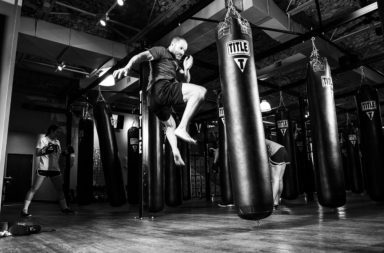 However, in all cases, avoidance is the best defense. In environments known to have spiders and scorpions, check your footgear and clothing every morning. Also, regularly check your bedding and shelter. Use care when turning over rocks and logs. Scorpions resemble small lobsters with raised, jointed tails bearing a stinger in the tip. You’ll find scorpions (Buthotus species) in deserts, jungles, and forests of tropical, subtropical, and warm temperate areas of the world. They are mostly nocturnal in habit. 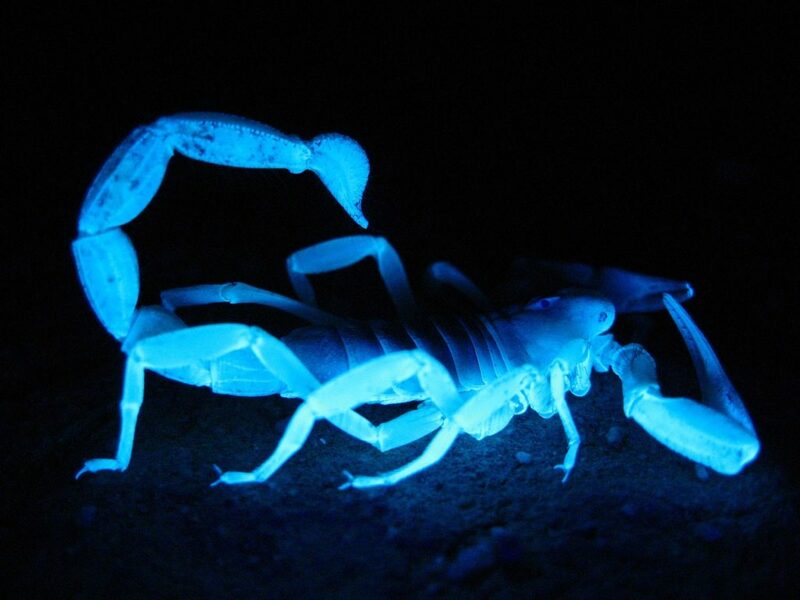 Desert scorpions are widespread — from below sea level in Death Valley to elevations as high as 3,600 meters in the Andes. Typically brown or black in moist areas, they may be yellow or light green in the desert. Their average size is about 2.5 centimeters. However, there are 20-centimeter giants in the jungles of Central America, New Guinea, and southern Africa. Fatalities from scorpion stings are rare, but they can occur in children, the elderly, and ill persons. Nature also mimics the scorpions with whip scorpions or vinegar-roons. These are harmless and have a tail like a wire or whip, rather than the jointed tail and stinger of true scorpions. You recognize the brown recluse (aka fiddleback) spider of North America (Loxosceles reclusa) by a prominent violin-shaped light spot on the back of its body. As its name suggests, this spider likes to hide in dark places. Though rarely fatal, its bite causes excessive tissue degeneration around the wound and can even lead to amputation of the digits if left untreated. You find members of the widow family (Latrodectus species) worldwide, though the black widow of North America is perhaps the most well-known. Found in warmer areas of the world, the widows are small, dark spiders with often hourglass-shaped white, red, or orange spots on their abdomens. Funnelwebs (Atrax species) are large, gray or brown Australian spiders. Chunky, with short legs, they are able to move easily up and down the cone-shaped webs from which they get their name. The local populace considers them deadly. Avoid them as they move about, usually at night, in search of prey. Symptoms of their bite are similar to those of the widow’s — severe pain accompanied by sweating and shivering, weakness, and disabling episodes that can last a week. Tarantulas are large, hairy spiders (Theraphosidae and Lycosa species) best known because they are often sold in pet stores. There is one species in Europe, but most come from tropical America. Some South American species do inject a dangerous toxin, but most simply produce a painful bite. Some tarantulas can be as large as a dinner plate. They all have large fangs for capturing food such as birds, mice, and lizards. If bitten by a tarantula, pain and bleeding are certain, and infection is likely. 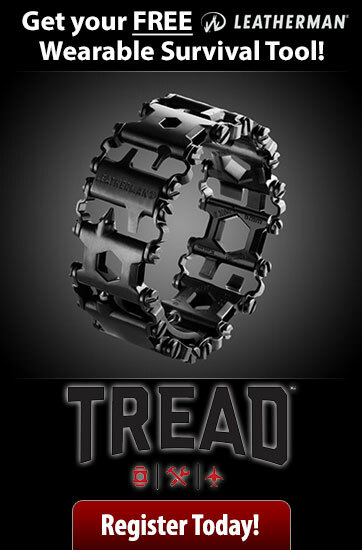 Centipedes and millipedes are mostly small and harmless, although some tropical and desert species may reach 25 centimeters. 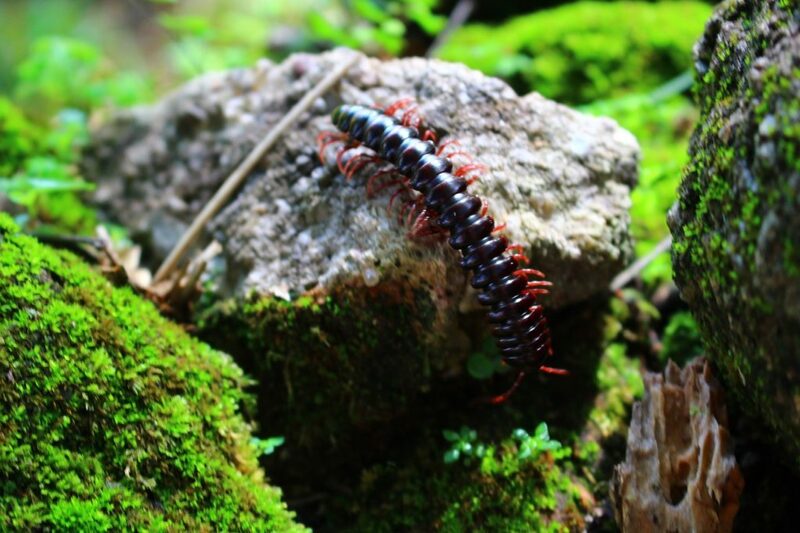 A few varieties of centipedes have a poisonous bite. But infection is the greatest danger, as their sharp claws dig in and puncture the skin. To prevent skin punctures, brush them off in the direction they are traveling if you find them crawling on your skin. We are all familiar with bees, wasps, and hornets. They come in many varieties and have a wide diversity of habits and habitats. You recognize bees by their hairy and usually thick body, while the wasps, hornets, and yellow jackets have more slender, nearly hairless, bodies. Some bees, such as honeybees, live in colonies. They may be either domesticated or living wild in caves or hollow trees. You may find other bees, such as carpenter bees, in individual nest holes in wood, or in the ground, like bumblebees. The main danger from bees is their barbed stinger located on their abdomens. When the bee stings you, it rips its stinger out of its abdomen along with the venom sac, and the bee dies. Except for killer bees, most bees tend to be more docile than wasps, hornets, and yellow jackets that have smooth stingers and are capable of repeated attacks. For all three of these insects types, avoidance is the best tactic for self-protection. Watch out for flowers or fruit where bees may be feeding. Be careful of meat-eating yellow jackets when cleaning fish or game. The average person has a relatively minor and temporary reaction to bee stings and recovers in a couple of hours when the pain and headache go away. Those who are allergic to bee venom have severe reactions including anaphylactic shock, coma, and death. If antihistamine medicine is not available and you cannot find a substitute, an allergy sufferer in a survival situation is in grave danger. Ticks are common in the tropics and temperate regions, so they are familiar to most of us. Ticks are small round arachnids with eight legs and can have either a soft or hard body. Ticks require a blood host to survive and reproduce. This makes them uniquely dangerous animals because they spread diseases like Lyme disease, Rocky Mountain spotted fever, encephalitis, and others that can ultimately be disabling or fatal. There is little you can do to treat these diseases once contracted, but time is your ally since they are slow-acting ailments. According to most authorities, it takes at least 6 hours of attachment to the host for the tick to transmit the disease organisms. Thus, you have time to thoroughly inspect your body for their presence. 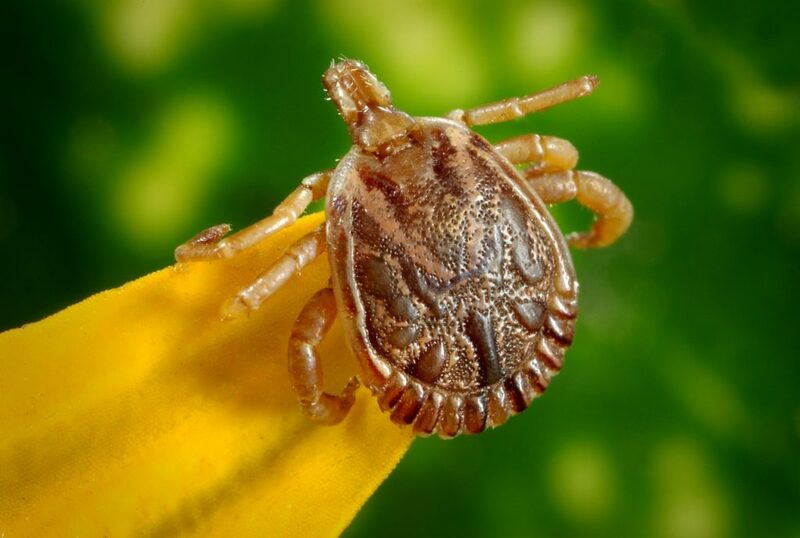 Beware of ticks when passing through the thick vegetation they cling to, when cleaning host animals for food, and when gathering natural materials to construct a shelter. Always use insect repellents, if possible. expedient water crossings through swampy, tropical vegetation and bogs. You can also find them while cleaning food animals, such as turtles, found in fresh water. Leeches are dangerous animals in that they can crawl into small openings; therefore, avoid camping in their habitats when possible. Keep your trousers tucked in your boots. Check yourself frequently for leeches. 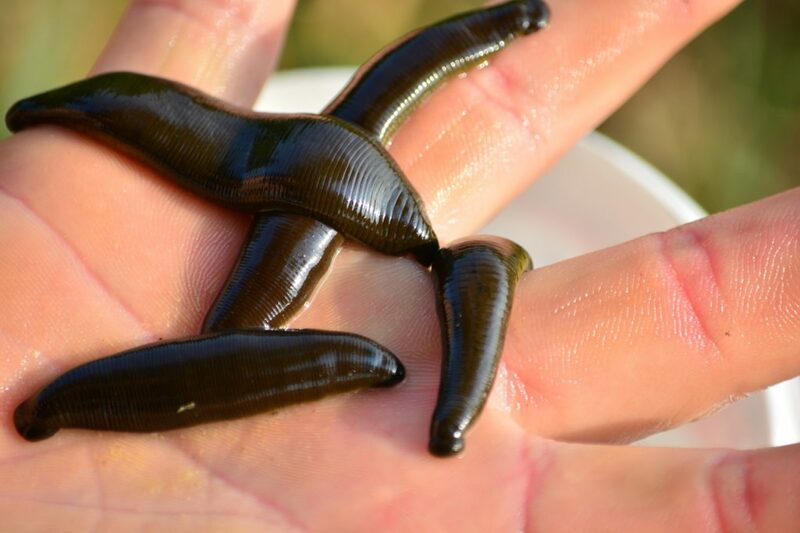 Swallowed or eaten, leeches can be a great hazard. It is therefore essential to treat water from questionable sources by boiling or using chemical water treatments. Survivors have developed severe infections from wounds inside the throat or nose when sores from swallowed leeches became infected. Despite the legends, bats (Desmodus species) are a relatively small hazard to the survivor. There are many bat varieties worldwide, but you find the true vampire bats only in Central and South America. They are small, agile fliers that land on their sleeping victims, mostly cows and horses, to lap a blood meal after biting their victim. Their saliva contains an anticoagulant that keeps the blood slowly flowing while they feed. Only a small percentage of these bats actually carry rabies; however, avoid any sick or injured bat. They can carry other diseases and infections and will bite readily when handled. Taking shelter in a cave occupied by bats, however, presents the much greater hazard of inhaling powdered bat dung, or guano. Bat dung carries many organisms that can cause diseases. Eating thoroughly cooked flying foxes or other bats presents no danger from rabies and other diseases, but again, the emphasis is on thorough cooking. Snakes are some of the most common and — depending on where you’re trekking — most dangerous animals. Unfortunately, there are no infallible rules for expedient identification of poisonous snakes in the field because the guidelines all require close observation or manipulation of the snake’s body. Like with all dangerous animals, the best strategy is to leave all snakes alone unless you know what the hell you’re doing. Where snakes are plentiful and poisonous species are present, the risk of their bites negates their food value. Walk carefully and watch where you step. Step onto logs rather than over them before looking and moving on. Do not tease, molest, or harass snakes. Snakes cannot close their eyes. Therefore, you cannot tell if they are asleep. Some snakes, such as mambas, cobras, and bushmasters, will attack aggressively when cornered or guarding a nest. Carefully check bedding, shelter, and clothing. Use extreme care if you must kill snakes for food or safety. Although it is not common, warm, sleeping human bodies occasionally attract snakes. Learn how to treat a snakebite like a pro. There are very few truly snake-free regions of the world. The polar regions are an exception due to their inhospitable environments. Other areas considered to be free of poisonous snakes are New Zealand, Cuba, Haiti, Jamaica, Puerto Rico, Ireland, Polynesia, and Hawaii. The Gila monster and the Mexican beaded lizard are dangerous and poisonous lizards. They aren’t the most common dangerous animals on land, but you should still be aware of them. The Gila monster (Heloderma suspectrum) of the American Southwest and Mexico, is a large lizard with dark, highly textured skin marked by pinkish mottling. It averages 35 to 45 centimeters in length and has a thick, stumpy tail. Unlikely to bite unless molested, it has a poisonous bite. The Mexican beaded lizard (Heloderma horridum) resembles its relative, the Gila monster. It has more uniform spots rather than bands of color (the Gila monster). It also is poisonous and has a docile nature. You find it from Mexico to Central America. This giant lizard (Varanus komodoensis) grows to more than 3 meters in length and can be dangerous if you try to capture it. 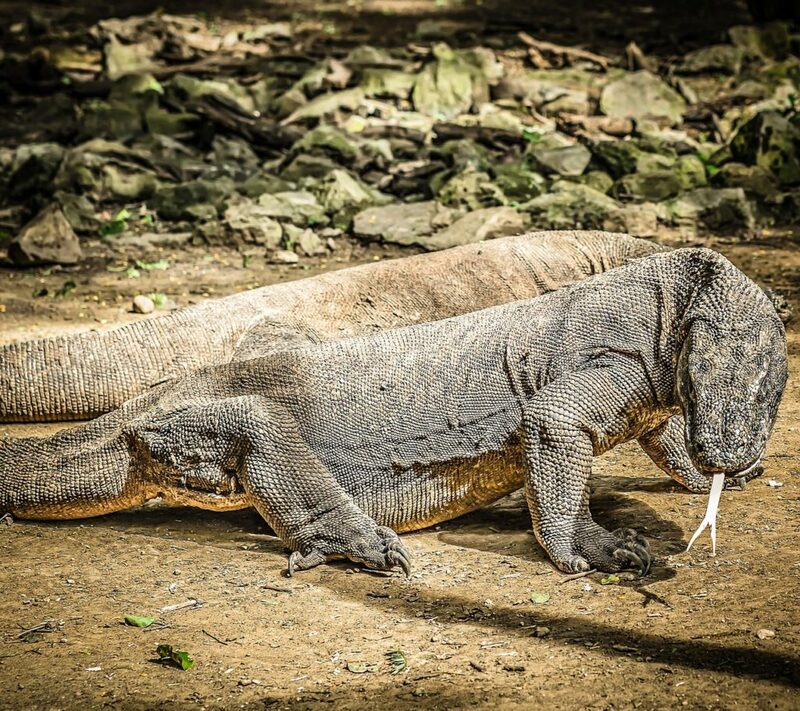 This Indonesian lizard can weigh more than 135 kilograms.